Join CAOT in spreading the word….occupational therapy works! Pledge to Ask for OT- get occupational therapy covered as part of workplace health benefits and win prizes! Our online impressions and impact keep growing! In October 2018, talk about occupational therapy to one person per day- either in person, online, by telephone, letter, or any way you can think of- during OT month and let us know on social media. This is also a great opportunity to share resources, information and your personal reflections on occupational therapy. Tag your posts on Twitter, Facebook, and Instagram with #31dayOTchallenge to join the online discussion and promote occupational therapy across Canada! NEW THIS YEAR: Take the pledge to #AskforOT and you could win! As we celebrate the profession and share stories this year, let's pledge to #AskforOT. We encourage you to ‘Ask for OT’ coverage, as a part of your own workplace health benefits; from your employer, your insurance provider and/or your union. Do that, then tell the world that you’ve taken the pledge! Feel good knowing that you have spread the word that Canadians – including YOU – deserve better access to occupational therapy services! Take the #AskforOT pledge and you will be entered into a draw for one of four $50 Pharmasave gift cards. The draw takes place Wednesday October 31 st. Thank you to Pharmasave for donating the gift cards. Whether you place a call, send a letter or both, we’d like you to share your pledge photos, experiences and outcomes on social media as part of the #31dayOTchallenge. And we would very much like to stay in touch to learn from your pledge experience. Provide feedback to CAOT: Please tell us about your pledge experience so we can track progress on obtaining health coverage for occupational therapy. Fill out the Ask for OT Feedback Form and tick the box to allow CAOT to use your quotes or input from your experience. Save the Ask for OT button image and use it in your social media post . This occupational therapy month, we pledge to #AskforOT! Add to your library and advance your practice. Did you know that more than 300 members currently filling volunteer roles with CAOT? CAOT couldn’t operate without the time, energy and skill that our members contribute to the association. Our mission of advancing excellence in occupational therapy would not move forward without volunteerism being central to the membership experience at CAOT. This month, meet some of your colleagues who contribute to CAOT committees, programs, professional development, advocacy initiatives and more! Check our the CAOT Volunteer Program: Get Involved and decide how you might get more involved in CAOT. 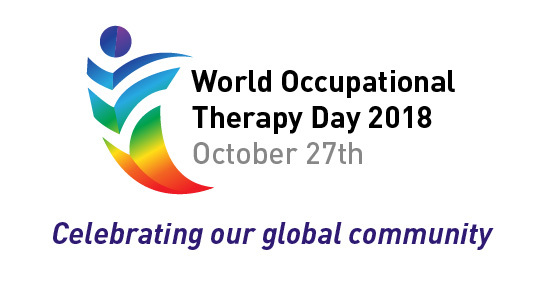 World Occupational Therapy day falls in OT month, so on October 27, let’s go global and help promote OT around the world! WFOT Virtual Exchange (#WFOTVX): Join Marilyn Pattison, WFOT President to launch World Occupational Therapy Day 2018. This interactive webinar that will be hosted live from Kazakhstan at 17.00hrs (ALMT). Join the webinar on October 27, 2018 . WFOT is also partnering with promotingot.org to support the OT Global Day of Service (OTGDS) that will take place on the 27th October. The WFOT has a range of resources that you can use to promote World Occupational Therapy Day 2018. They can be downloaded from the WFOT Resource Centre . Find out more about World Occupational Therapy Day 2018.